You will love the brightly colored, fully equipped kitchen, large living room, separate dining room with plenty of seating. There is a half bath, separate shower room and laundry on the first floor. The second floor has 3 bedrooms and a full bath with claw foot tub. The master bedroom has a queen bed and a seating area in which to enjoy your morning coffee. The second bedroom also offers a queen bed and the third bedroom has 2 single beds. The porch has ample seating for all and includes a porch swing for your enjoyment. 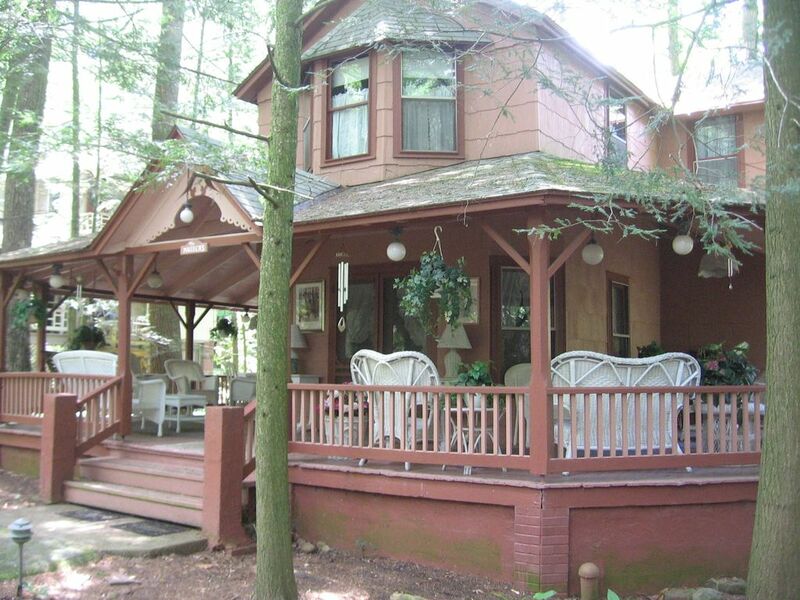 This Victorian cottage is located in the Campmeeting on a quiet walking street. However, it does offer off street parking in the rear of the property. You will love relaxing on the large wrap around porch. Imagine your self sitting in the porch swing enjoying your evening cocktail and planning your next days events. toilet, 1st floor with seperate shower closet. Best cottage in the Campmeeting area! Great cottage on a walking street with plenty of parking out back. The porch is its greatest asset which one can see from the photos. Our beds in the spacious bedrooms were quite comfortable and the furniture in the huge living room also comfy. Our memories will draw us back to The Pink Cottage! Mt. Gretna is an amazing place ... Relaxing and calming. Great time with family and experience the Mt. Gretna porches! This cottage has an amazing porch ... and that is all it has. The kitchen is the nicest room however very dated ... Old rusty silverware and pots and pans; dirty stove. No AC window unit downstairs and in hot weather makes it very uncomfortable ... Old style furniture and uncomfortable. Very crowded to sit six around dining room table...only folding chairs. Mold in upstairs bedroom, bathtub had a black ring around it, could see light through floor board below, old style fans afraid of old electric wiring...shower closet is very, very small and right by the back door. We left a day early due to uncomfortable conditions for my grandchildren and the adults. Like staying in a museum ... Was afraid we were going to fall through the upstairs floor or a house fire because of all the fans plugged in!! Do not recommend this rental. I am prompted to submit my comments after reading the prior review. My 3 adult daughters and I had a perfectly lovely stay at the Pink Cottage this July. Renting someone else's cottage always presents unsatisfactory accommodations. However, in this perfectly ideal community, this rental offers more positive space and location than one could expect. Yes, it is not one's modern contemporary home. It isn't meant to be. It is,however, the perfect summer cottage for a week or two's vacation away from the city life and into a friendly,walkable, safe community both for adults and children. I hope to return next summer, the good Lord willing, and will seek out the Pink Cottage . I could live on the porch!